First, consider if you think you will need a steel toe boot. Steel toe boots have, just as the name implies, steel in the toe of the boot. This helps prevent your toes from being crushed should something fall on them. This feature also helps if you "kick" things into place like I do. I find the extra toe protection to be a good thing, however some find the unforgiving toe space too confining. 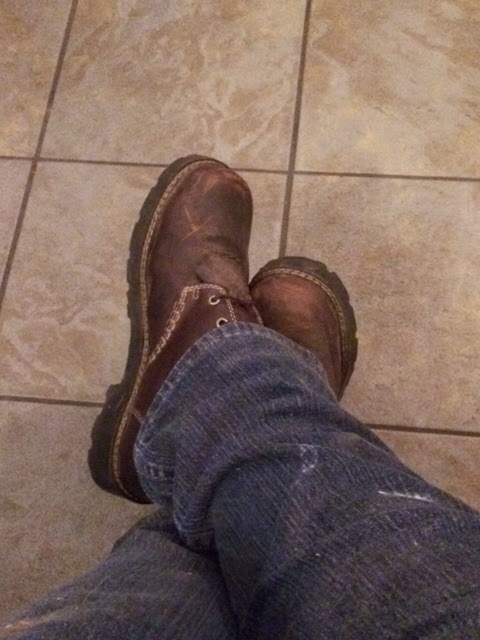 My current boots do not have a steel toe, however, if I was working in a toe-crushing potential environment, I would make sure to get a steel toe boot. Secondly, do you want a solid leather boot, lightweight nylon boot, or a boot made of both? I chose to go with all leather uppers, but friends of mine swear by boots that are more like a hiking boot. I like the protection and durability of leather. However, some people enjoy the lightweight tennis-shoe-like feel of a nylon boot. I find that suede in a boot is useless around the farm as it tends to tear or water rot too quickly and thus the boots wear out long before they should. Choose your boot to fit your climate as well. If you work in a very wet environment, stay away from suede and look for a boot with solid leathers and nylon that can dry quickly. 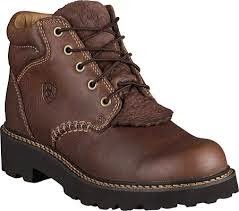 If you want a more water tight boot for wet climates or working in snow, go with a solid leather boot. Thirdly, what kind of tread do you want? My boots have a lug sole. Vibram soles are common in work boots.This type of sole is thick and has lots of tread to grip. Many other styles of soles are available and should be chosen based on the terrain you will be working in or on. I like the sole on my boots as I find them to have great traction when I am going up or down hill carrying or pulling heavy objects. This style of sole will also help when things get slippery this winter. The fit of your boots is really important. Take the time to try on several pairs of boots. Considering going a size up or a size down, as not all boots are created equal in fit. My boots, in case you are curious, are Canyon by Ariat. They run around $100 and you can find them here on Amazon. Breaking in your boot should only take a day or two. Mine, as you can see from the before and after photos, only took one day of work to break in. I care for my boots with saddle soap and mink oil, both of which are sold at big box discount stores. Cleaning and conditioning your leather boots regularly will help them to stay water resistant and supple, helping extend their life. My boots are indispensable to me. I cannot imagine working around the farm without them. You can find me wearing them with shorts, pants, and sometimes, when I run outside for something at bedtime or early in the morning, with my nightgown. 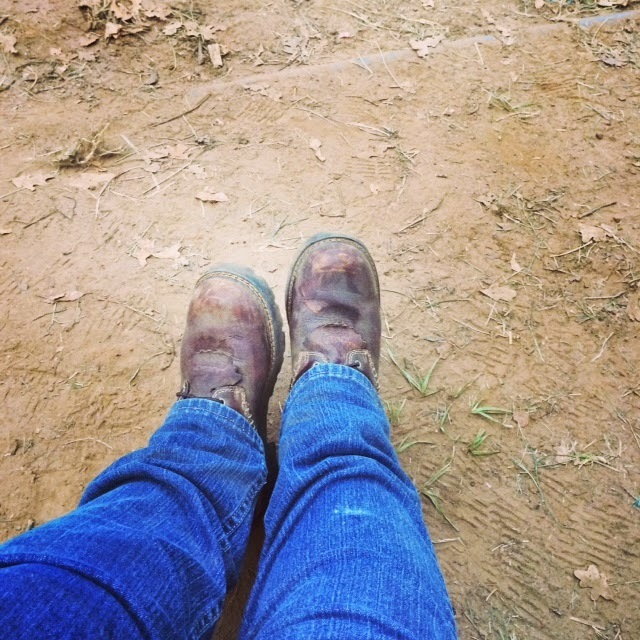 My boots are the most essential tool on my homestead.